Get Relief with Appetite Relief™. 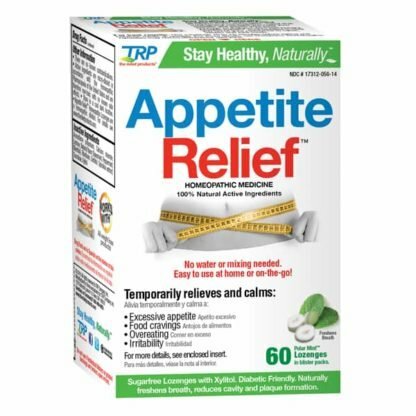 Temporarily relieve and calm your excessive appetite, food cravings, overeating, stress eating, irritability, and that empty stomach feeling with Appetite Relief™ lozenges, a homeopathic medicine that helps change your personal habits to support your weight loss goals. Use Appetite Relief™ as directed for best results and with any other weight control products you may be using to Stay Healthy, Naturally™. Each carton contains 60 lozenges; a 20-day supply. Take 1 lozenge, 3 times per day. The best way to lose weight and keep it off is to follow a healthy eating plan, reduce calories, and exercise regularly under the guidance of your health care provider according to the U.S. National Institute of Health. Appetite Relief™ can help you curb your appetite and relieve your food cravings, so you don’t feel hungry. Appetite Relief™ is a homeopathic medicine that temporarily relieves and calms excessive appetite, food cravings, overeating, stress eating, irritability, and that empty stomach feeling associated with a change in personal habits to support weight loss. Appetite Relief™ with Xylitol is diabetic friendly and naturally freshens breath and reduces cavity and plaque formation. Appetite Relief™ is safe and gentle to use, with no known side effects, interactions with other medications or contraindications. Use Appetite Relief™ as directed for best results. You may use Appetite Relief™ with other weight control products. Appetite Relief™ is sugar-free and naturally sweetened with xylitol. Xylitol is a naturally-occurring sweetener found in plants. It is widely used as a sugar substitute and has added dental benefits in the form of tooth whitening, breath freshening and reduced rates of cavity formation and periodontal disease. See www.xylitol.org for details. According to homeopathic indications, these ingredients temporarily relieve and calm appetite related symptoms of: • excessive appetite • insatiable hunger • overeating • food cravings • empty stomach feeling • irritability after diagnosis by a physician. *These statements are based upon traditional homeopathic practice. They have not been reviewed by the Food and Drug Administration. A physician should always be consulted to rule out serious causes. • This product is intended to complement, not replace, standard medical treatments. • Initial worsening of symptoms may occur. • If pregnant or breast-feeding, ask a health professional before use. • Keep out of reach of children under the age of 12. • In case of overdose get medical help or contact a poison control center right away. • Suitable for adults and children 12 years and above. • To use a lozenge, place it in your mouth and let it dissolve slowly. Try not to chew or swallow the lozenge. • Use one lozenge 10 to 15 minutes before each meal. If you feel hungry between meals, you make take one lozenge as needed, up to 10 lozenges a day or as directed by your physician. • This product’s effectiveness is directly related to the degree which you reduce your daily food intake. Attempts at weight reduction without a change in personal habits to support weight loss will compromise this product’s effectiveness. • Homeopathic remedies may not be effective for everyone. • There are no known contraindications. • Active ingredients are micro-diluted in accordance with the Homeopathic Pharmacopoeia of the United States and are therefore non-toxic with no known side effects. • Store in a cool dark location. Q: What is Appetite Relief™? Answer: Appetite Relief™ is a homeopathic product that provides temporary relief from the appetite-related symptoms of weight maintenance or reduction, such as excessive appetite, food cravings, melancholy, mental and physical withdrawal, and irritability. Use Appetite Relief™ as directed for best results. Q: How does Appetite Relief™ work? Answer: Appetite Relief™ works via the traditional homeopathic mode of action, which is that Appetite Relief™ utilizes small amounts (micro-dilutions) of homeopathic ingredients that gently assist the immune system to address symptoms associated with excess appetite cravings. Q: Is Appetite Relief™ FDA Approved? Answer: The FDA does not “approve” any homeopathic products in a similar way that they review and approve prescription drugs. However, Appetite Relief™ is registered with the FDA, complies with the FDA Compliance Guides (CPG 7132.15) Good Manufacturing Practice guidelines. As a result, Appetite Relief™ meets FDA standards and is listed in the FDA database of drugs, the Homeopathic Pharmacopeia of the United States (HPUS), and can be marketed as an OTC product according to the FDA. Answer: Appetite Relief™ is sugar-free, and naturally sweetened with xylitol. Xylitol is a naturally occurring sweetener found in plant material. It’s widely used as a sugar substitute for many different products, and has added dental benefits in the form of tooth whitening, breath freshening and reduced rates of cavity formation and periodontal disease. Q: What if Appetite Relief™ doesn’t work? Answer: Keep at it. Appetite Relief™ works to address your food cravings if used as directed. Answer: Homeopathic remedies have no side effects, and have a 200 year track record of being safe for children over the age of 12 and adults. As always, if you have concerns about your appetite cravings, it is always a good idea to consult your physician. Q: How long should I use Appetite Relief™ before I get relief? Answer: Continue to use this product for as long as you like to get the results that you seek. There are no harmful ingredients in this product, so prolonged use will not harm you. Q: What reactions, complications, or side effects are there? Answer: Appetite Relief™ is a homeopathic product that uses all-natural active ingredients. It has no known side effects or interactions with any other medications that you might be taking. Our products are safe for adults and children over the age of 12. We recommend visiting a health care professional to rule out any serious conditions. Q: Why must I wait for 10 minutes before or after eating or drinking to take Appetite Relief™? Answer: Appetite Relief™ is a homeopathic product, and is most effective if taken 10 minutes before or after eating or drinking, and 10-15 minutes before each meal. Q: My Child/pet ate the lozenges, what should I do? Answer: Keep Appetite Relief™ out of the reach of children under the age of 12. If consumed, please contact the Poison Control Center immediately at 1-800-222-1222. Appetite Relief™ can be toxic to animals, so please keep the product in a safe location inaccessible to animals. If your pet consumes the product, contact your local veterinarian immediately. Q: Can I use Appetite Relief™ if I am pregnant or nursing? If I have a medical condition? If I am taking other medications? Answer: If you’re pregnant or nursing, ask a health care professional before use. Appetite Relief™ is a homeopathic product, meaning that it acts gently and naturally with your body. You may use your other medications while using our product without concern. Questions regarding use under a medical condition should be directed to your healthcare provider. Q: Does Appetite Relief™ contain gluten, animal derivatives, latex, or dairy products? Answer: No, Appetite Relief™ does not contain any gluten, animal derivatives, latex, or dairy products.